Individually packed serving sizes of Udon Noodles, with seasoning sachets to make the accompanying soup. Ingredients: Noodles: Wheat Flour, Modified Tapioca Starch (E1442), Enzyme (Lipase), Refined Salt, Water, Acidity Regulator (E260, E575, E350, E270, E325). Soup Base: Fritters, Dried Boiled Fish Paste, Dried Green Onion, Dried Seaweed, Refined Salt,Glucose, Bonito (fish), Engraulis Japonica, Flavour Enhancer (Monosodium L-Glutamate E621, Disodium 5-Inosinate E631), Powdered Soy Sauce, Seasoned Cuttlefish Powder, Refined Sugar, Shrimp Powder, Katsuo Bushi (Fish), Garlic Powder, Red Pepper Powder, Onion Powder, Acidity Regulator (Calcium Carbonate E170, Sodium Carbonate E500, Sodium Phosphates E339), Glycin, Caramel Powder E150, Capsicum Powder. 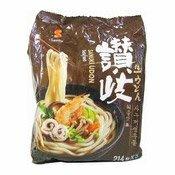 Simply enter your details below and we will send you an e-mail when “Sanuki Udon Noodle Multipack (Seafood Flavour) (日本烏冬麵)” is back in stock!